New Delhi: With the final draft of the updated National Register of Citizens (NRC) due to be released Monday, Assam is preparing itself for an unpredictable situation. There is little clarity on how the release of this contentious list, which determines who is a genuine Indian citizen, will be received. The NRC, first published after the 1951 Census, is now being updated keeping 24 March 1971 as the cut-off date to essentially identify those who immigrated to Assam illegally from what is now Bangladesh. 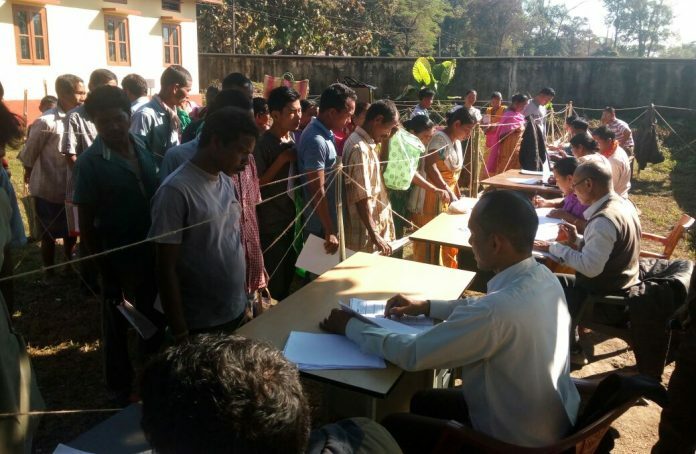 Applicants have to submit documents to prove that their names appeared in the NRC of 1951, or in any of the electoral rolls of Assam till 1971, or in any of 12 other documents, which had to have been issued before 1971. Effectively, the purpose of the process is to determine who in Assam are genuine Indian citizens and who are illegal immigrants. This exercise is monitored by the Supreme Court and began in September 2015 under Tarun Gogoi’s Congress government. It was taken forward by Sarbananda Sonowal’s BJP government after it came to power in 2016. It involves multiple steps — inviting and receiving applications, verification, publication of the first draft, publication of the complete draft, receipt and disposal of claims and objections, and finally, the publication of the final list. The list expected Monday is still just the complete draft — after this, applicants will be given a chance to make claims and objections, before the final list is out. The final list will be referred to the Foreigners Tribunal, and those left out can appeal to the courts. The government has been emphasising on the fact that adequate chances will be given to applicants, and there will be enough platforms to redress grievances in an effort to minimise panic. The first draft of the National Register of Citizens was released on 31 December 2017 and had the names of about 1.9 crore persons out of a total of 3.29 crore applicants. The release of the draft went off smoothly, despite the state government predicting a tense situation and deploying additional forces. The issue of illegal immigrants from what is now Bangladesh — irrespective of religion — has been a delicate issue in Assam for decades, with the indigenous Assamese harbouring a resentment against the immigrants for what they see as eating into their limited resources and benefits. The state, in fact, had seen a strong anti-outsider sentiment and widespread resentment against even against the influx of Marwaris and Biharis. This anti-“outsider” feeling has assumed several social and political undertones. The Asom Gana Parishad and the All Assam Students Union — both important political players — built their politics on the six-year Assam agitation demanding identification and deportation of illegal immigrants. The agitation ended in 1985 with the signing of the Assam Accord between leaders of the movement and the government of India. It made 1 January 1966 the base year for detecting foreigners and 24 March 1971 the cut-off date for detecting illegal foreigners and removing them from electoral rolls. Ahead of the assembly elections in the state in 2016, the BJP had made the deportation of illegal Bangladeshi immigrants a key campaign issue. However, the party’s opponents and critics believe this campaign theme helped the BJP further its Hindutva agenda, especially since it has been pushing for citizenship to Hindu refugees. This criticism against the BJP further gained ground with the Citizenship (Amendment) Bill introduced in the Lok Sabha on 19 July 2016 by the BJP-led NDA government. According to the provisions of the bill, illegal migrants who are Hindus, Sikhs, Buddhists, Jains, Parsis and Christians from Afghanistan, Bangladesh and Pakistan will be eligible for citizenship in India. Therefore, if the bill is indeed passed, it would mean that the Hindu refugees identified as illegal immigrants would be given citizenship, but not Muslims. BJP’s ally AGP, however, maintains that it wants all illegal Bangladeshi immigrants to be deported — whatever be their religion — and has consistently opposed the proposed Citizenship Bill, seeing it as a violation of the Assam Accord. Politically, the BJP would want to let the process continue till the Lok Sabha polls in mid-2019, enabling it to go its voters asking for another term to fulfil this mandate. In the state, opposition parties like Congress and the All India United Democratic Front (AIUDF) have alleged that the exercise is not being carried out in a fair manner and is creating fear in the minds of the minority community. There is absolutely no clarity on how those eventually identified as illegal immigrants would be dealt with. Given the diplomatic and humanitarian aspects, deportation seems like an unlikely option. Giving them the status of ‘stateless’ people and denying them certain state benefits is an option that has been talked about. There is also the fact that nearly everyone in the state has voter ID cards — a proof of citizenship. Thus, it would be a contradiction if some of those who do not find their names in the list have voter IDs. ThePrint visited Assam to assess the situation on the ground after the release of the first draft of the NRC. You can read the reports from that visit here, here and here.